The Street brand began in Sheffield in 1946 offering repairs and maintenance to cranes. It wasn’t until 1956, when they acquired new premises in the Peak District that they began manufacturing their own overhead crane systems. Over the coming years, owner Peter Street, a former World War 2 spitfire pilot, developed new technology for overhead cranes which placed them, and has kept them ahead of competitors. In the late 1980’s & 1990’s things went from strength to strength and developed an advanced wire rope hoist specifically for use on its overhead crane systems, The ZX electric wire rope hoist was born with a design to rival all others. 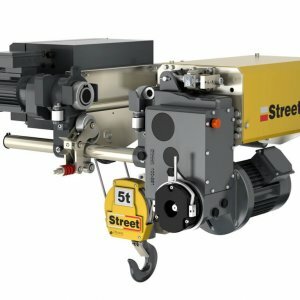 The robust, reliable, easy maintenance and innovative design has placed Street as a world leader in wire rope hoist technology. Lifting Hoists Direct is proud to be associated with this brand and product and can supply and install the ZX wire rope hoist.